What the world doesn’t need right now is another “news” report on Charlie Sheen and his “tiger blood” and “winning” or another article about how important it is for all of us to embrace social networking sites. So, I decided instead to write a short piece on social networking, old school style. If you are over 40 years old, odds are you remember the days when things moved more slowly and people stopped to chat in the streets of rural and urban communities, or met at the old neighborhood coffee shop before work and on weekends – just to talk in person, imagine that. If you are over 50 you probably also remember how people used to sit on their front porches in the evening and on weekends and socialize with their neighbors and passersby. Even if you are only 30, you remember chatting around the water cooler or coffee machine or going out to lunch with co-workers, but these activities are also in decline. Who has time for that anymore with all those emails, projects and back-to-back meetings waiting for us? Today, in the information age with multiple electronic devices at arms-reach and a demand for ever-increasing productivity, old school social networking has been replaced by digital social networking from a mobile device or a laptop, often while multi-tasking on one or more other business and/or personal tasks. As a Father of two teenage children I have more than a little concern about the long term implications on the “people” skills of the Millennials generation, since they never experienced old school social networking first hand. The other day, my friend Veronique made an observation about the local Starbucks in my town. She noted how people of all ages were actually sitting around at the tables and having conversations with what looked like a mix of friends and family. Yes, there were also people there with their laptops or smart phones, but they were actually in the minority. We got to talking about it and noted how Starbucks has managed to replace or preserve if you wish a small piece of good old face-to-face social networking. This is perhaps more true of Starbucks stores located in rural communities than those located in cities, but that was and is one of the reasons people move to the suburbs anyway, to be part of a community and I don’t mean a virtual community. So in a world where Facebook has over 500 million users – that’s 1 in 12 people on the planet, and Charlie Sheen was able to get 1 million followers in his first 24 hours on Twitter, I thought it was worth recognizing and even celebrating the fact that Starbucks does more than just sell rather expensive brews of coffee with funny names – they also preserve a much needed piece of Americana. 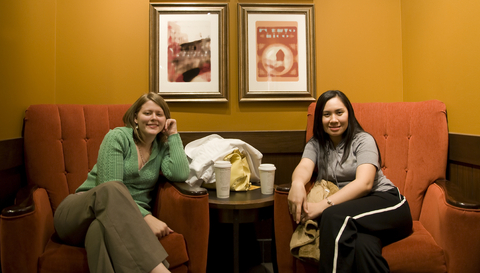 It’s worth noting that even as Starbucks has worked to reinvent themselves over the years by selling product line extensions and even updating their logo, they did not give in to the temptation to take away the chairs, tables and couches to instead display and perhaps sell more “stuff”. That would make them just another retailer. Maybe there is a lesson here for all of us. Most people don’t just go to Starbucks to get good coffee. They go for the experience and the atmosphere and are willing to pay a premium for that, even in a recession. That’s the power of a great brand! This entry was posted in Digital Marketing, Entertainment, Marketing, Social Media by Steven Copertino. Bookmark the permalink.